Our neat home on quiet residential street (sleeps up to 6) has tranquil decor. Our neat home on quiet residential street (sleeps up to 6) has tranquil decor, carpet in upstairs two bedrooms, tile on main level (LR, DR, & kitchen ); one full bathroom upstairs and one half bathroom main level, and a private backyard patio. Guest will be greeted by myself or member of my family upon arrival. Home is conveniently located to Yankee Stadium , Harlem, upper Manhattan, and Riverdale. Queen size sleeper sofa unfolds in living room. Home has thermostat controlled heat and air conditioning. Kitchen fully stocked with appliances such as kitchen aide, refrigerator, dishwasher, coffee maker, and rice cooker. Home has cable TV, DVD player, and WiFi access. Guest may smoke on outside backyard patio (do not throw butts on the ground) but no smoking inside. Free gated parking for one car. Just 2 short blocks to #2 train into Harlem and Manhattan. Also within short walking distance to #6 train and multiple bus lines. Less than 1 block to neighborhood sandwich shop for sandwiches, salads, and beverages and more; also available nearby supermarkets. Seasoned traveler who enjoys the comforts of home at home and abroad. Spacious and comfortable with a private backyard. Off the street parking and conveniently located within short walking distance to bus and train transport. Travelers must use their own cell phone. Telephone is available in home for emergency only. Located in unit on the main level. Living room seats 8 people, with cable TV and DVD. Sleeper sofa unfolds into a Queen size bed. Large modern refrigerator with ice maker, refrigeration and freezer sections. Staple items provided such as spices, condiments, bottled water and hand towels. Dishes and utensils can serve 6 to 8 people. Dining room table (rectangular) seats 6; and a second table in the living room seats 4. Cable TV with multiple channels including sports. Radio and CD player in the unit. Large private backyard patio for dining and soaking up the sun and small front deck for relaxing and taking in the scenes. 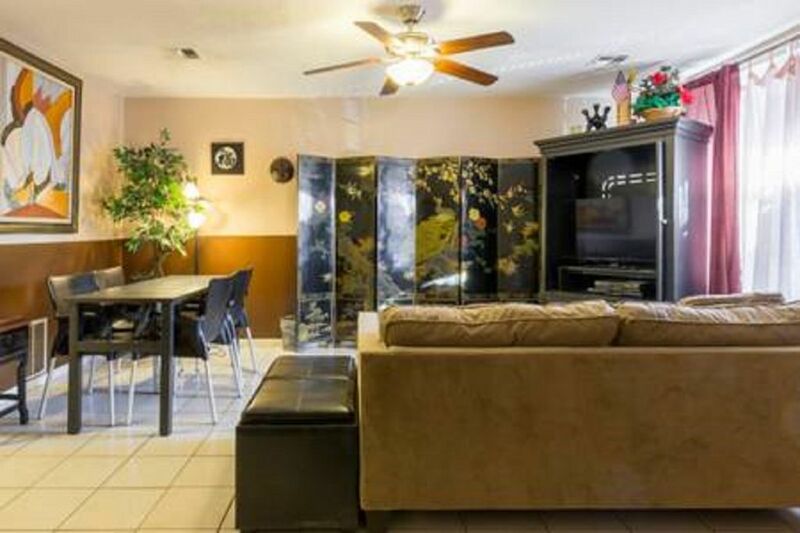 Great location, friendly owners, easy subway access, and the home had everything we needed. We had a great visit and would totally stay here again! My family stayed st this lovely townhouse while attending our son’s commissioning in the army and graduation from Fordham. The house is lovely and very clean. We highly recommend this rental. The home is so well kept and clean. Very spacious, private and conveniently located near the subway. The owner and manager are helpful and easily reachable. The manager even kindly called me when I had forgotten my wallet after checkout. Very trustworthy and kind hearted people! My family and I had a very great mini vacation and really enjoyed our time here. The pictures truly don’t do it justice! I would definitely recommend this property!! We aim always to provide a 5 Star experience. Thank you! We enjoyed our stay here. Well equipped kitchen, lots of room, VERY CLEAN! Nice private back yard and very secure. Thank you. We are glad you enjoyed your stay! We had the a wonderful time at the townhouse. The townhouse was very roomy and clean. It had everything you would need while staying in there. Willie was a great manager. He showed us that the grocery store was 5 blocks from his property and that the subway was only 3 blocks. The subway was able to get us anywhere we would like to go in NYC. We were able to go everywhere that was on our agenda. We walked everywhere and had no problem getting to and from the townhome. The neighborhood was a quiet but also friendly neighborhood during the day. My husband and I traveled with a 14, 11, and 7 year olds and they just love the townhome. The kitchen had everything you would need to make breakfast, lunch and dinner meals. Their was plenty of room at the table for a sit down dinner, The kids love the TV's in their rooms. July16 -21 was a very warm week in NYC and to come back to a cool place was wonderful. Willie was available by text everyday so that eased our mine in case we had situation we had someone to contact immediately. We are from Iowa and had the greatest experience in the Bronx. My family would recommend this townhouse to anyone who wants a great experience in NYC. We are planning on coming back in the future and this is the place we will stay at again. We truly love this townhome and location. Their is not one negative thing about this townhouse. We just loved it!!! Thank you! We look forward to you and your family returning. The multicultural neighborhood is conveniently located 20 minutes from LaGuardia Airport, within walking distance of multiple bus routes that goes to Manhattan, Bronx Zoo, Botanical Gardens, Yankee Stadium, Arthur Ave "Little Italy", and fresh seafood venues on City Island. Pio Pio Pervuian restaurant on Cypress Ave in the Bronx should be a must stop on your list; and for quick take out of mouth watering Southern cuisine add David Soul Food Cafe on Castle Hill Avenue in the Bronx . Plan your visit and prepare to explore!! Check out everything you need to know about the Bronx from the Bronx Tourism Council brochure online.